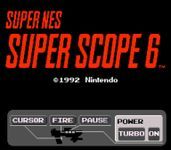 Grouped with the Super Scope light gun, Super Scope 6 featured a total of 6 games presented in a Carnival / Arcade like style. The player is prompted to select either Blastris or Lazer Blazer, each selection has a grouping of three games. Blastris A has the player playing a Tetris like game on its side. The player is able to shoot blocks to reduce their size in order to form complete vertical columns. Blastris B is more akin to games like Columns where the player is attempting to match colors in rows, columns or at diagonals. Shooting most blocks will change the order of the colors. Mole Patrol is a whack-a-mole like game in which the player tries to shoot as many moles within a time limit as possible, while avoiding the red moles. Mole Patrol can be played in multiple stages or just a single stage. Intercept has the player shooting down missiles of various sizes (to indicated distance from the player) before they reach the other side of the screen. This is also the only 2 player game available. Getting hit 5 times will end the game. Engage has the player shooting down planes and missiles as if they are on a plane. The player must also be quick as the plane they are on will run out of fuel if the player takes too long. Getting hit 5 times or running out of fuel will end the game. Confront has the player shooting down planes and missiles again, only this time they are not restricted by ammo or fuel. Getting hit 5 times will end the game.